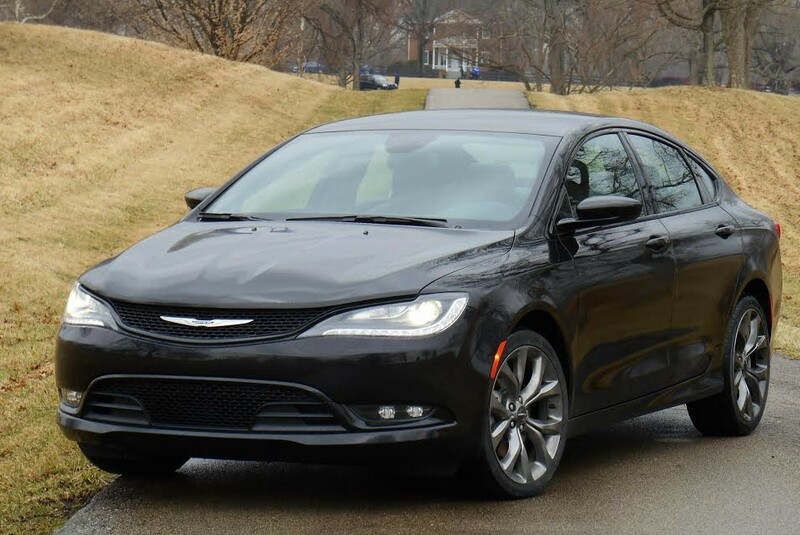 Driving the 2015 Chrysler 200: It’s Better, But Is It a Giant Slayer? All new for 2015, the Chrysler 200 is available in LX, Limited, S, and C trim levels. An S is shown here on its standard 18-inch wheels. Chrysler says that midsize sedans make up the largest segment in the automotive marketplace. But the company really hasn’t had strong offerings in that class of late, and in fact, neither have the other American manufacturers. In recent years, the three biggest sellers have all been foreign makes: the Toyota Camry, Honda Accord, and Nissan Altima. In 2013, Camry counted nearly 408,000 sales, Accord accumulated nearly 367,000, and Altima amassed about 321,000. Meanwhile, the Chrysler 200 – which came in 8th in midsize sales – managed fewer than 123,000. Furthermore, many of those were to fleets (such as rental-car companies), which are typically far less profitable than are those to individuals. 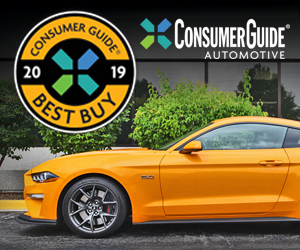 In all, the top-ten midsize contenders racked up sales of more than 2.3 million units, which means the 200 accounted for just over five percent. With such huge numbers at stake, Chrysler is hoping to raise its ranking – or at least its sales – with a redesigned 200 slated to go on sale in the second quarter of 2014. Based on initial impressions, it may just do both. Styling. Yes, it’s subjective, but it’s hard to argue that the new car isn’t better looking. And that goes double for the interior. All-wheel drive. The new car offers it where the old one didn’t. Even in this segment, more and more buyers consider it a “gotta have” feature – that most of the 200’s competitors don’t have. Segment-competitive fuel economy. Still not tops, but it’s right up there, with up to a 5 mpg increase over last year’s cars. Features. On both the safety and infotainment front, the new 200 offers many that weren’t previously available, some exclusive to the segment. Styling. It bears mentioning again. It also bears mentioning that being “better” isn’t quite the same as being “good” – particularly in a segment that’s so competitive. But the new 200, while not a runaway “best,” is certainly good enough to warrant consideration. 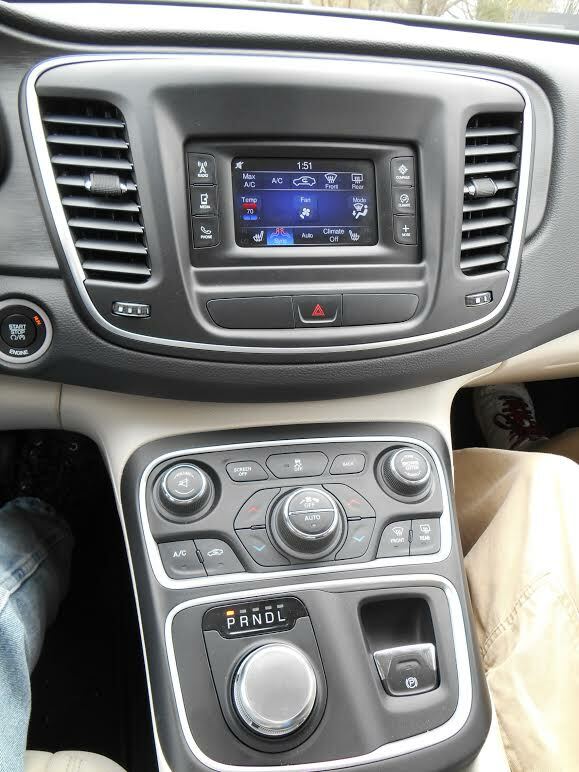 All models except the base LX come standard with Chrysler’s Uconnect media interface and an 8.4-inch touch screen monitor. A C model is shown here. When you’re up against such established (and impressive) benchmarks as the Camry, Accord, and Altima, you have to offer something they don’t – or at least better them in some regard – to make a dent. You also have to not lag in any area. So let’s do a report card of sorts. The 200’s base engine is a 184-horsepower 2.4-liter 4-cylinder mated to a segment-first 9-speed automatic – standard. Also linked with the 9-speed is the uplevel engine, a 295-horsepower 3.6-liter V6 – the most powerful in the segment. The 2.4 isn’t as refined as the best 4-cylinders in this class – mostly due to a rather raucous full-throttle moan – but it cruises quietly and is competitive in power. By contrast, the V6 is much smoother, and when pressed, pulls with authority and emits a decidedly sporty growl. With both engines, stabbing the throttle while underway would prompt the transmission to kick down fairly quickly at around-town speeds, though at higher speeds, the engine would rev up quickly, but actual acceleration took longer to be delivered. We didn’t have an opportunity to check fuel economy on our preview drives, but the 4-cylinder model’s EPA numbers of 23 city/36 highway put it just below mid-pack among top competitors. Ditto the V6’s 19/32 rating, though more for the “city” part than the “highway” (credit the 9-speed automatic here). Also note that the uplevel engine on many competitors is not a V6 anymore, but rather a 4-cylinder turbo. The 200’s available all-wheel drive is only offered with the V6 engine, and it cuts the EPA numbers to 18/29 – this despite the fact Chrysler says the system completely disconnects the rear wheels in order to save fuel when their added traction is not needed. However, that compares favorably to the Subaru Legacy 6-cylinder’s 18/25 (24/32 on the 4-cylinder version), but not so much with the Ford Fusion AWD’s 22/31, though that’s with a 4-cylinder turbo. By the way, those are the only two among the 200’s direct competitors to offer all-wheel drive. Trim levels include the base LX ($22,695), well-equipped Limited ($24,250 – expected to be the volume seller), sport-themed S ($25,490), and luxury/performance C ($26,990). A five-inch touch screen is standard in base LX models. In terms of ride and handling, the 200 also rates about par. It’s always hard to judge based on a preview where we’re driving different roads than we do during normal tests around the office, but nothing stood out as being either noticeably good or bad. However, there seemed to be a little more on-center “slop” to the very light steering than is the norm, and the brakes also seemed to take more pressure than normal to bring the car to a stop, but both are something we got used to. What stood out more was the difference between the 200C with V6 we tested and the 200 Limited with the four. Yes, the optional V6 (the 200C comes standard with the four) provided much stronger acceleration, but the tauter touring suspension and optional 19-inch wheels on the C really made themselves known. Our drive route included many tight turns, and the 200C felt very confident and agile on them, befitting its sporty intent. Then we got into the Limited and …. whoa! The first tight turn we bent into had the body leaning and the 17-inch tires moaning at speeds that didn’t faze the C. There was a commensurate difference in ride quality as well, with the Limited absorbing bumps better, but we didn’t find the C at all objectionable in this regard. This is truly one of those “try before you buy” situations, because there’s enough difference that you’ll likely have a preference. Also slightly different were the noise levels; overall they were low, but it seemed that the C’s sportier tires produced more road roar at speed. Then there’s the interior. We didn’t test a base model, but we did sit in one after the drive portion of the event. It was kind of an eye-opener. Aside from the cloth on the seats being a bit different, it seemed to have the same numerous soft-touch surfaces, ritzy-looking trim, and great storage solutions as the Limited and C, so it didn’t come off as a cut-rate price leader. For one thing, the dashtop and door tops are padded, a nice touch at this price level. Available two-toning helps give the interior a richer look, as does some bright trim (mostly black on the sporty S) and “colorful” styled instruments and controls. Also aiding the ambiance is that the gearshift is a large, classy-looking rotary knob on the console. While perhaps not everyone will like it, I’m a real fan. Not only is this electronic shifter very easy to use, but it frees up a lot of real estate on the console. Also under the console. Chief interior designer Klaus Busse noted that a conventional console shift lever is “just the tip of the iceberg,” as the mechanicals attached underneath take up a lot of space. In the 200, that space is instead used for a cavernous center-console bin that’s topped by a sliding cover with cupholders and holds Aux, USB, and 12-volt jacks. There are also a deep glovebox, divided map pockets, and a large lower-console tray. This is about as good as cabin storage gets in a midsize sedan, at least in terms of sheer volume. Slightly less impressive is the trunk. It’s decently large, and the rear seatbacks fold down to expand the space, but they rest a few inches above the level of the cargo floor, so you can’t just slide long items in. Also, the pass-through is rather restricted in size. Also a bit restricted in size is the rear-seat area. My 5’9 head nearly brushed the roof, and though I had plenty of legroom “sitting behind myself,” a tall person in front with the seat pushed far back would have left me with little knee room. Also, the back edge of the door opening slightly interfered with my hip on exit. There’s adequate adult room up front, but visibility is hurt by thickish roof pillars, and the driver might find it a bit of a stretch to some of the more distant audio and climate controls. Temperature is adjusted by tedious, repetitive-step pushbuttons on the console panel, but they’re flanked by good ol’ knobs that adjust fan speed along with audio volume and tuning. 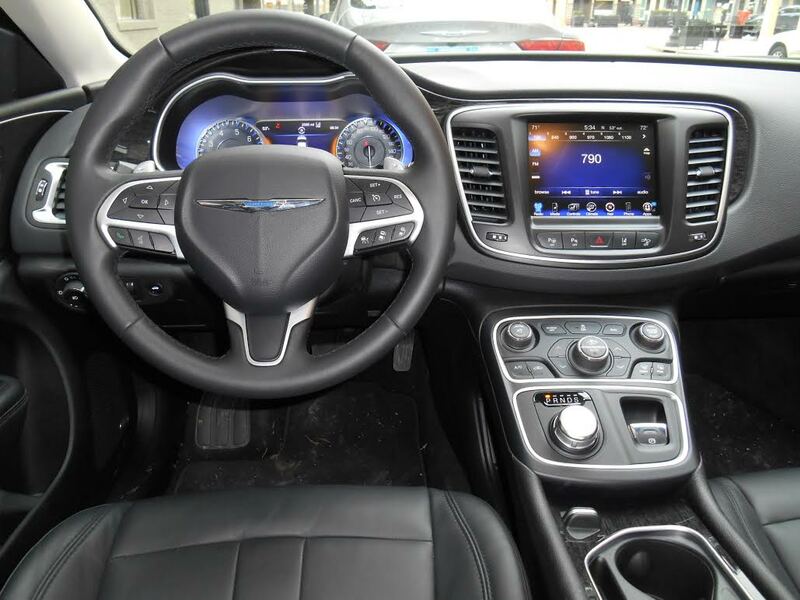 Other adjustments are made through the dashboard touch screen, which is about five inches diagonal on LX models with Chrysler’s basic UConnect 3.0 audio system, 8.4 inches with the available UConnect 5.0 infotainment system. 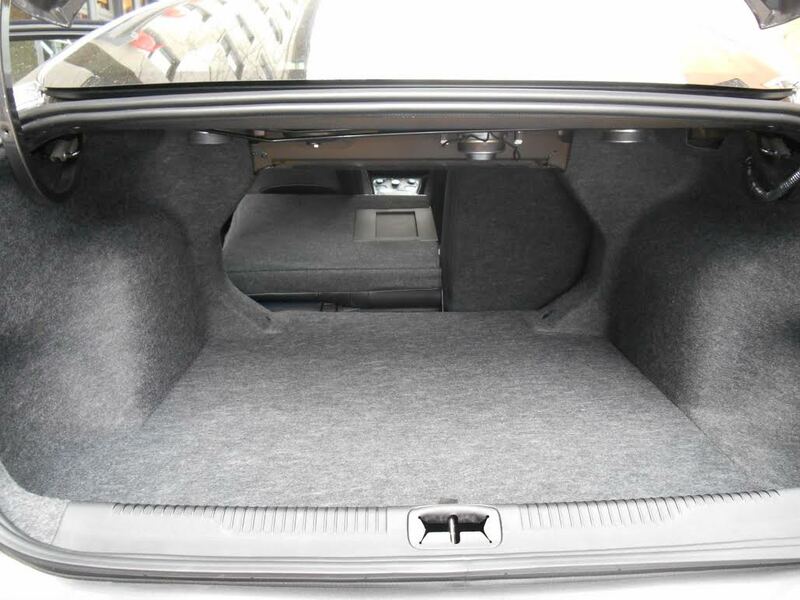 The trunk is roomy and accommodates longer parcels, but the rear seats don’t fold flush, complicating loading and unloading. Standard LX features include the 9-speed automatic, air, keyless entry and starting, power windows, 6-way front seats, steering-wheel mounted audio controls, and 17-inch steel wheels. Limited adds UConnect 5.0, Bluetooth wireless cell-phone link, a compass, and 17-inch aluminum wheels. Options include a sunroof, satellite radio, and 18-inch wheels. The 200S is aimed at (according to Chrysler) a “more sinister style and sportier driving experience,” and includes black cloth upholstery, an 8-way power driver seat, paddle shifters, power heated mirrors, black interior and exterior accents, sport suspension, and 18-inch aluminum wheels. Options include the 3.6-liter V6, all-wheel drive, sunroof, navigation system, and 19-inch wheels. Standard on the top-line 200C are leather upholstery, heated front seats, rearview camera, remote start, dual-zone automatic climate control, universal garage-door opener, touring suspension, and 17-inch aluminum wheels. Optional are the 3.6-liter V6, all-wheel drive, navigation system, and 19-inch aluminum wheels. Also offered is the SafetyTec Package, which consists of rain-sensing wipers, lane departure warning with lane-keep assist, automatic high-beam control, forward collision warning, adaptive cruise control with stop-and-go feature, blind-spot alert, cross-traffic alert, and the class-exclusive parallel and perpendicular park assist. It lists for $1295 – seemingly a bargain – but initial information indicates it’s only available on the top-line 200C. Which is too bad. So the report card is a good one, if not an A+. The 200 makes its mark with available all-wheel drive, a rich-looking interior, impressive cabin storage, and a strong array of features (though we think some – such as Bluetooth and a rearview camera – should be available on all models). It might not be enough to unseat any of the top models from their lofty berths, but it certainly should increase Chrysler’s current five-percent share. Written by: Rick Cotta on April 7, 2014.on September 25, 2018.